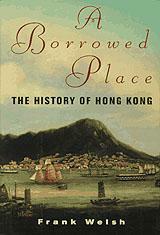 Book review: "A Borrowed Place: The History of Hong Kong"
This review first appeared in the American Reporter in 1996. When this was published, Beijing was preparing to take back possession of Hong Kong on July 1, 1996; leading up to that momentous date, the Communist government of mainland China and the colonial authorities in the British protectorate were tussling over what the constitutional and legal framework for the new Hong Kong would be. For Americans, trying to understand the issues being fought over is like trying to understand the custody struggle in somebody else's divorce. Frank Welsh's history of Hong Kong, "A Borrowed Place," does a fairly good job of providing context for the political situation over there. It does a less complete job of capturing anything of the social or cultural flavor of the city, though, focusing almost exclusively on the colonial administration and relations between London and Beijing. This is definitely a British history, both in perspective and style. Welsh acknowledges his prejudices up front in the forward, and challenges Chinese historians to provide a similar history from their viewpoint. The style, true to British form, is stuffy, detailed and dryly academic. It's also, however, quite unlike the British tradition in that it is noticeably incomplete, even in its coverage of political goings on. Probably the most interesting period in Hong Kong's history to the average American reader would the 1960s and '70s, when Hong Kong really took off both economically and culturally, becoming a modern city state. It was during this period that Hong Kong became a global economic power, modernized its skyline, and took its place alongside Singapore and Taiwan as Asian brokers to the West. Yet that period is given little attention by Welsh; instead, he focuses much more attention on the colonial period and the political machinations that dominated early Hong Kong. It's interesting as far as it goes, but what defines Hong Kong today isn't long-forgotten cricket matches when the crown prince stopped by for a visit with the governor  it's the economic explosion and rising standard of living, both of which are now threatened by Beijing's takeover. Of course, Hong Kong has always been a strange place: neither country nor colony, a city built in China by England. Originally, the British wanted a place from which to direct their potentially lucrative trade with China; after Portugal, Germany and Russia were granted various footholds on the mainland, Great Britain acquired Hong Kong  then a mostly barren island inhabited by, at most, several hundred fishers and their families. So Hong Kong, the city, is every bit as much British as it is Chinese, and always has been. Welsh does a really good job of pointing out how, nearly from the beginning, British citizens in Hong Kong have been far outnumbered by Chinese and other Asians who came to Hong Kong seeking economic freedom. The common thread running throughout "A Borrowed Place" is the conflict between the traditions and customs of the Chinese and the sensitivities of the British who ran the place. From the British perspective, the governing of Hong Kong was unusually sensitive to local (read Chinese) concerns  although it was never, until a few years ago, even remotely democratic. And to their credit, the British implemented and vigorously defended personal liberties and political freedoms unheard of at any time in mainland China's modern history. The British also, if belatedly, insisted on imposing public sanitation programs that greatly improved public health in Chinese quarters (fairness would demand that it be pointed out that the original, dismal conditions also came to be under British rule). "A Borrowed Place" ends with the appointment of Chris Patten, the last British governor who so vigorously tried to implement democratic reform before turning over the reins to the decidedly undemocratic dictators in Beijing. As Welsh candidly notes, if the British had instituted these reforms 20 years ago the Chinese might feel compelled to respect them. Instead, even as Welsh finished this book in 1995, Beijing was working to dismantle Patten's reforms. Headlines in the months since the handover have only confirmed the Chinese government's intent to restrict political freedom while keeping intact as much as possible the economic engine that drives Honk Kong's financial growth. The model China is using is clearly Singapore. It would seem that the relationship between Hong Kong, with its century and a half of Western orientation, and its new masters in Beijing is likely to prove as fraught with misunderstandings and tension as its relationship with Britain has been. And it seems unlikely that the bureaucrats in Beijing will do any better of a job of putting Hong Kong's interests first than Welsh's history shows the bureaucrats in London to have done.